It's a wonderful think when fellow collectors know your specialty and find something that fits your collection. This happened to me yesterday when Chris Hernandez offered me this CREB beehive at the Garland, TX swap meet. This is the second time Chris has had a CREB beehive that I wanted for my specialty collection. Now if I can only return the favor! 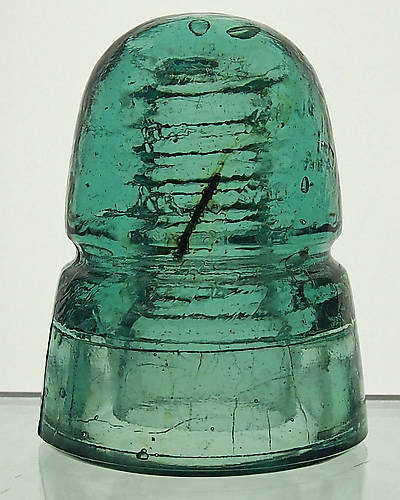 This EIN  green aqua CREB has a whole finishing nail up front and center pointing to the arced "W. Brookfield" embossing. Neat piece that is definitely display worthy. Thanks again, Chris! Hope to see you and the family again in Round Rock.